In modern day Buenos Aires, city buses dominate the cobblestone street that previously belonged to gauchos. However, every Sunday the streets are blocked off for the weekly Feria de Mataderos, a market that embraces Argentine tradition. From March-December it runs every Sunday from 11 am until the evening. January and February a reduced version takes place on Saturday evenings starting at 6 pm, due to the summer heat. Bring cash for the vendors! Being completely honest, the Mataderos Market isn’t very easy to get to. But there are a number of colectivos (city buses) you can take. If you're wanting to test the public transportation of Buenos Aires, go here to plan your bus route. It will take around 45 minutes to an hour. Taxis, Uber & Cabify, of course, are always an option for those looking for a quicker trip. You can also take the Subte E line to the very end, then catch a taxi from there to lower you taxi fare. Mataderos is a quite a bit off the beaten track on the western edge of the city. The name Mataderos, which translates to the slaughterhouses, lays bare the history of this western barrio. For many years, Mataderos was where the urban met the rural. A commercial hub due to its livestock market and slaughterhouses. Mataderos was the main stop for rural gauchos within the city limits. Tradition has always been important here. Payadas, or improv lyric contests, regularly took place in the local bars. 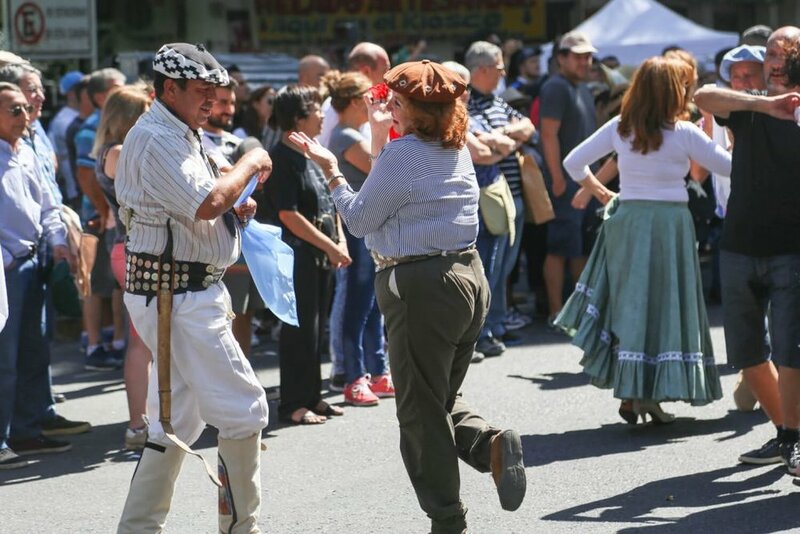 Even today at the weekly Mataderos market you can almost feel the pride emanating off of those dancing to the traditional folkloric music. How must it compare to the payadas of the past? Mataderos was often referred to as "Nueva Chicago," for the American city's role in the American meat industry. Chicago also served as a sort of meeting point for the midwestern countryside and the urban slaughterhouses of the city. Matadero's soccer team is actually still called Nueva Chicago so you'll see reference to them and their colors of green and black all over the neighborhood. 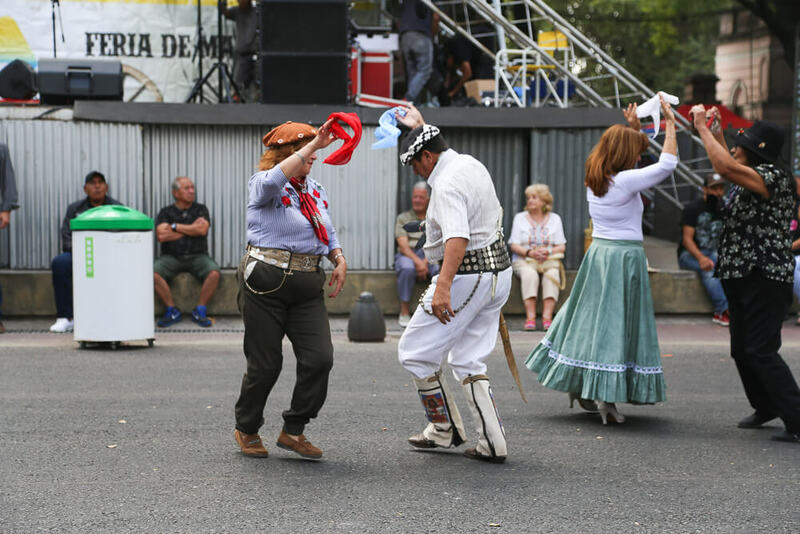 My absolute favorite part of the Feria de Mataderos is the traditional music and dances. Buenos Aires is famous for its tango, but Argentina has beautiful music and dances from many other regions as well. In the center of the market, you'll find the dance floor and stage. There's a gaucho MC running the day's schedule, announcing the performances and bands that will perform on stage. People come to dance and look like they come every week. Most come just as they are, in their street clothes, and dance the day away. 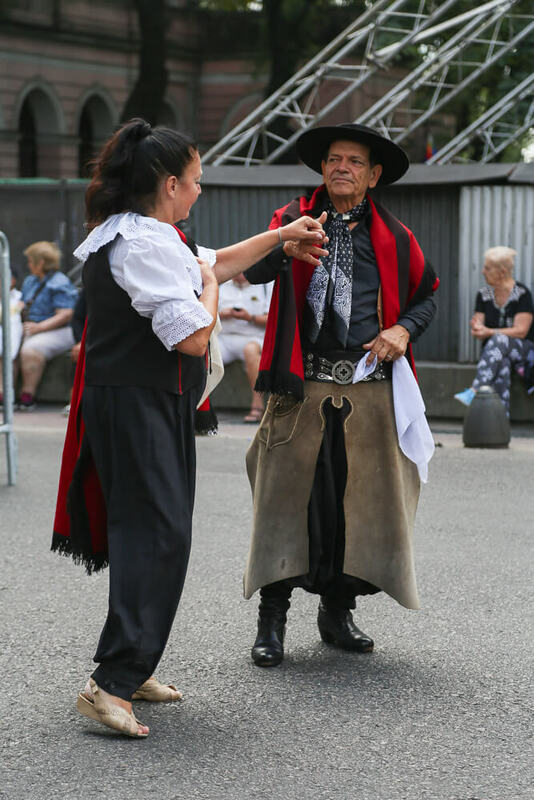 But some come dressed to the nines, in their traditional leather boots, bombachas (gaucho pants), pañuelos (handkerchiefs) and ponchos. Listen for the chamamé from the province of Corrientes or the chacarera from the province of Santiago del Estero. Handkerchiefs fly and singers make sounds that remind me of Mariachi's yelling. I. Love. It. The music you'll hear here is filled with all of the joy drained from the depressing tango lyrics you'll hear downtown. In the center of the main square, just behind the stage, you'll see a statue of a man atop a horse. The sculpture, El Resero (named for the gaucho herding cattle), was finished in 1932 by Emilio Sarguinet. It quickly received criticism based on the horse's gate. Horses walk with their front right foot and back left foot, alternating. But this horse is carved with both the right front and right back legs stepping forward together. Everyone claimed the artist had made a very obvious mistake! The skeptics were the ones in the wrong. The artist depicted the pasuco breed perfectly as they walked in this particular way, both feet on the same side advancing together, to allow for a more peaceful gate. The rider could rest and even fall asleep atop a pasuco, and get much-needed rest for the long rides through the pampas. Ya'll, the food here is so good that my mouth is watering just typing about it. The four-block market is filled with food stands frying up empanadas and grilling up chorizo. You can go for a cheap and always delicious choripan (chorizo sandwich above), slathered in chimichurri. There are traditional empanadas from Salta and Tucuman in the north. Looking for something off the " red meat/grill" menu? Try humita, a creamy corn mixture cooked in a corn husk. Or order tamales or locro (a hearty, traditional stew). Whatever you choose, come hungry! The blocks sprawling out from the main square are lined with stands selling every souvenir you thought you wanted and those you didn't know you wanted. Leather belts, mate cups, ponchos, textiles, you'll find it here. The stands on Avenida de los Corrales sell delicious edible goods, from olive oil to salami and cheeses. Walk slowly and taste things along the way. My favorite is always the dulce de leche liqueur. If you're lucky, you'll get to see gauchos show off their best horse riding skills. Unfortunately, it no longer takes place every weekend. We were told it's about once a month but that it isn't regular. If it's happening, it would be at around 3:30 pm along Avenida Lisandro de la Torre. The carrera de la sortija is the highlight. With a tiny ring hung from a metal arch, gauchos stand in their saddles, racing at full pace towards the ring trying to get a pointy stick through the tiny ring as the fly past. 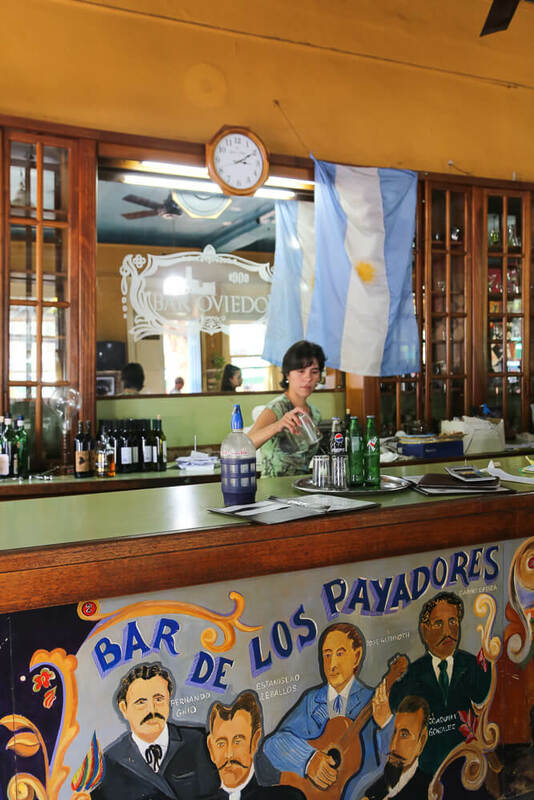 To rest your feet with a coffee or wine, stop by Bar Oviedo at Lisandro de la Torre 2407. It's been open since 1900. 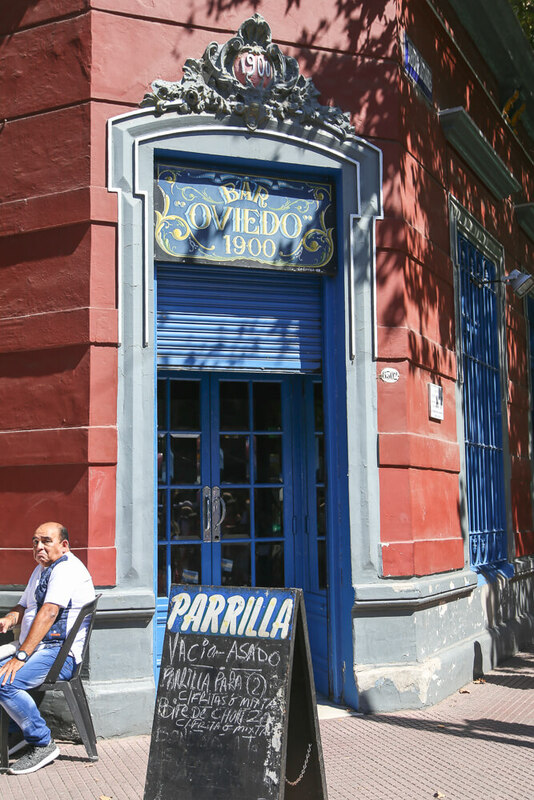 Bar Oviedo is one of the official "Bares Notables" of the city, a list of historically important bars and cafes located throughout Buenos Aires. It was a meeting point for the workers from the slaughterhouses and the cattle workers coming in from the countryside. Oviedo was the stage to many a "payador", like Nicanor Reyes, who weaved amongst the tables singing traditional Argentine folkloric music. If you're not thirsty or hungry, still take a peek inside to see a bit of history as it looks frozen in time. I really hope you make it out to the Mataderos market. It's really something special and one of my favorite things to do in Buenos Aires. If you love to experience a local culture and venture off the beaten track, Mataderos is for you. Let me know below if you've been and loved it! Or if you want to go and have any questions.